After years of designing and making projects for books, publications and licensing, Etsy is the perfect outlet for the work that I love to do. It has been a wonderful place to share my designs with collectors and makers all over the world. These days my focus is on designing and stitching at House Wren Studio, my creative home since 2006. My samplers give stitchers a chance to play with color and thread while experimenting with stitches. The designs are often made up into pillows, ornaments or framed. I welcome you to post photos of your finished pieces on Facebook or Instagram and tag me. Love, love to see what you do! I'm House Wren Studio, designer and maker. 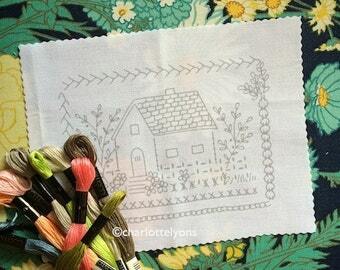 Currently, I'm offering a number of stitching samplers in my shop. I also teach crafts, host and teach at art retreats and blog at HouseWrenStudio.com since 2006. Thanks so much for shopping here...I really appreciate your interest and support. Visit me at HouseWrenStudio online. LMK right away about any issues. I'll work with you to correct any problem or issue and more than anything, want you to be happy. Direct checkout preferred. If you would rather send a check, I will ship as soon as it clears. Email me for an address to send to. I do my best to ship within a few days of purchase. I use USPS. Look for the yellow envelope in your mailbox! International orders do not include insurance, and as such are ineligible for refund/credit/replacement if lost or stolen. All duties or customs fees are the responsibility of the buyer.